Unfortunately the issue of standards is often misunderstood, with great emphasis placed on the back to back (btb) dimension of a wheelset and little else. When speaking of standards there are five absolutely crucial dimensions to consider. For wheelsets there are the btb and the flange thickness. For track, the gauge, the flangeway width, and the dimension over the check rail faces. The most important relationship is that which prevents any part of the wheel flange from striking the point of the frog. Generally a train running through a point in a trailing direction will not experience difficulty unless the btb is tight on the check rails. Running through a facing point, particularly on a non-tangential road, is a different matter. The greater the interference (the amount by which incorrect dimensions will allow the flange to strike the frog nose or point) the greater the potential problem. At worst the train will 'split the point' i.e. it will try to run up the wrong side of the point from which it is set, or the flange striking the frog will flip the wheel up and derail it. 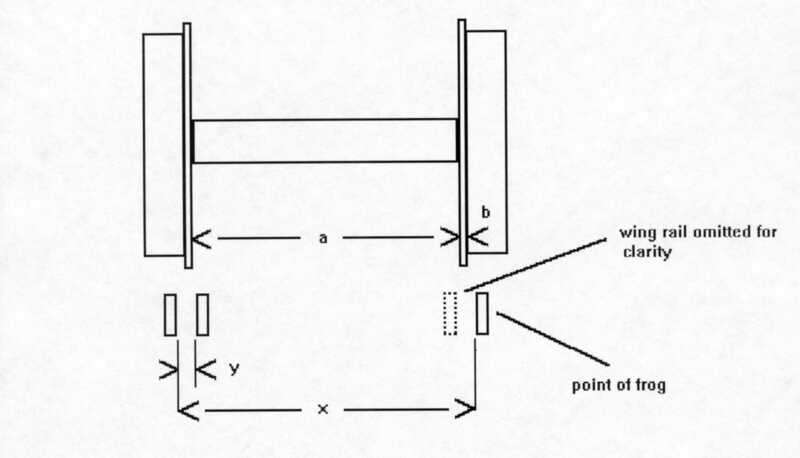 This latter problem does not require that large an interference particularly if the train is running fast, and/or the stock is light in weight. Propelling stock through pointwork when shunting is also likely to show up interference at the frog. Hopefully what follows will be of help. 0.3mm clearance With Unified but little room (.0.05mm) for error. Note also that the quoted figure is 30mm in all cases. With current GOG (just). GIMRA Flangeway - 29.0 (32 - 3) Not compatible with wheelsets of any of above. Interference at frog potentially 0.5-0.75mm, with Tenmille wheelsets, 1.0mm See below for resolution to this problem. Note that the wheelset dimension should be the same as or slightly less than the track dimension. If the figures are the same there is less tolerance of errors in either track or wheelset. Note also that flange depth is also a limiting factor particularly with respect to the depth of the crossing at the frog on moulded mass-produced points intended for track power. The greater the disparity here the greater the risk of electrical discontinuity, particularly if the points are of the 'dead frog' variety. Flange depth also limits the minimum rail code used, though the finer the flange depth the closer one is to having to consider fitting compensation/springing to cope with track irregularities which seem part & parcel of the outdoor environment. I personally consider a flange depth of 2mm to be a good median between 3mm and 1.5 or finer. The other factor in basic compatibility is whether the back to backs will clear the check rails. Above by summation assuming all the point flangeways to be equal. 27.6mm and 28mm. Ok with all ON THIS TABLE but see above. Also appears can be intolerant within the standard. (3mm) - 26 Will take any wheelset ON THIS TABLE. But see above table Any compatibility here is gained at the expense of potential interference at frog. The back-to-back measurement must be greater than the over guard (check) rails dimension. Note that in all these standards there are maxima or minima, but you 'may be robbing Peter to pay Paul'. A major failing of all standards I have come a cross so far, regardless of gauge, is that while Maxima OR Minima are quoted for figures, there is no indication of tolerances. As the standards are largely for the benefit of the manufacturers it seems odd that acceptable room for manufacturing error is not clearly stated. Ideally there should be stated for each dimension a Maximum AND Minimum. After all the name of the game is to stick as closely/accurately as possible to the standard dimension accepting that there will be some SLIGHT variation. The 'Unified' standard of 1951 was a compromise after the setting of the 1950 fine and coarse standards. It was an effort to provide standards on which both Coarse and Fine could run. From the notes you will see that it was a) something of a dog's breakfast, and b) that the Coarse 'scale' folk had to do rather more compromising than the Fine 'scale' folk. Needless to say the Unified standard is now something of a folk memory. The 1950 coarse standard survived unaltered until it was realised that the track and wheel dimensions described in the top table, being the same, left little room for error. The flangeway was reduced in width by 0.3mm by the GOG in the late 80's to resolve this problem. This has reduced the btb over check rail tolerance from 1mm to 0.4mm but this seems to work. I suspect that a fair bit of 32mm gauge pointwork has been built using check rail chairs intended for Ga I (3mm flangeway). This is problematic, especially for wheelsets of 28.5mm btb when there can be up to 1mm interference between wheel flange and frog. A solution is to cut through the check rail chairs to release the check rails on the OPPOSITE side to the frog. Clean the check rails up and solder them to drilled brass tabs (most model shops have K metal stands or similar with suitable brass strip) and pin them back in position using a gauge to give a flangeway of 2.2mm. DO NOT BE TEMPTED TO REDUCE THE FLANGEWAY FURTHER, or 28mm btb wheelsets will start to have trouble. This is the same method by which Brandbright point kits now fix their check rails. Do not worry about the wing rail flangeways next to the frog. Railwood do a roller gauge but do ask what the flangeway dimension is before buying. The whole issue could be put to bed if the 16mm Association FIRMLY recommended to manufacturers that the current Gauge 0 Guild coarse standard be followed ,with the exception of the wheel profile. For the wheel profile I suggest the use of the GIMRA standard for three reasons. Providing it is set at 28mm btb its flange width is the same as the GOG standard so there should be no interference at the frog. The flange depth is slightly greater at 2mm; some may see this as an advantage and it should present no problems with most trackwork. The greater wheel width means a greater tolerance of any errors at the crossing. Last, but by no means least, as most manufacturers also build for 45mm ga they will not need the expense of different tooling for 32 & 45mm ga wheels. And finally: All information in this article is provided in good faith. Please note that the figures are based on the latest information that I have managed to get so far. If you know anything more up-to-date please e-mail me at : sam.c.evans@lineone.net.